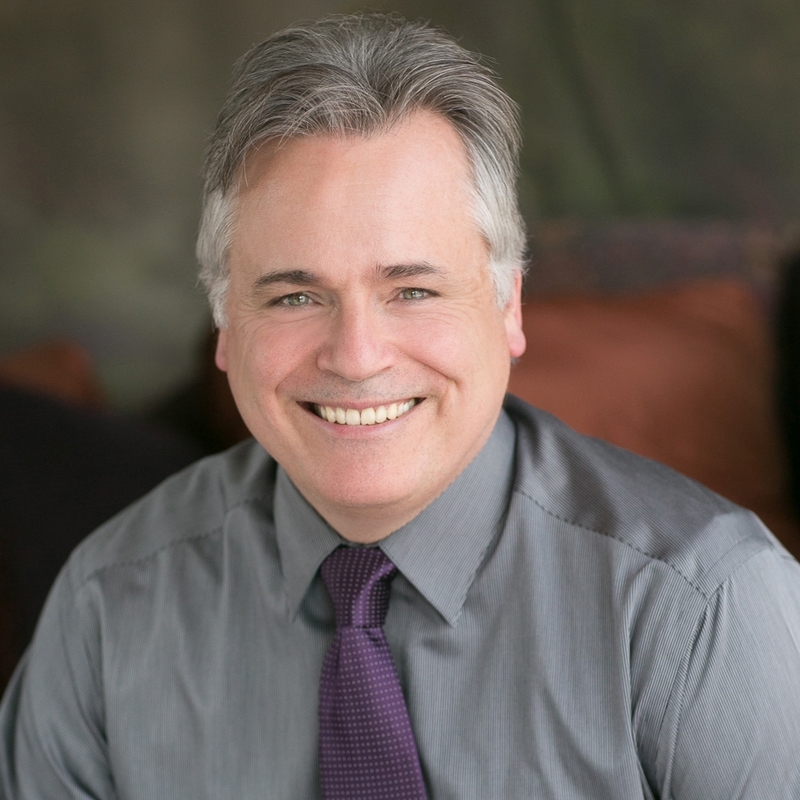 Today we visit with Matt Faulkner. 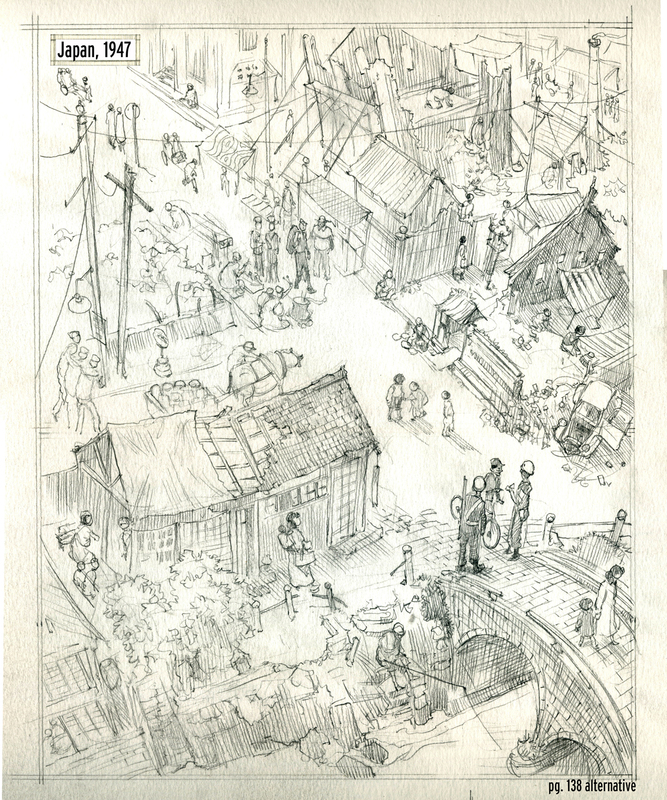 His award-winning graphic novel, Gaijan, has never been more darkly relevant than it is today. It’s a good time for middle-grade readers to know this powerful story, and to become aware of this chilling, “round ’em up” period in American history. Welcome, Matt, thanks for visiting my blog today. You might appreciate this: I first became aware of you with the publication of The Amazing Voyage of Jackie Grace in 1987. I loved that book –- so richly imagined and, I still think, an accurate depiction of a child’s imagination. Bath time has never been the same for me. You’re very welcome. I’m happy to spend some time talking with you and happy, too, that we can share our conversation with your blog readers. Oh, you mean Chet and Gladys? They’re awesome. In regard to Jackie Grace, thanks, that’s very kind. It was my first author/illustrated book and only the second book I’d worked on. It was tremendously exciting to get that manuscript purchased and also very misleading to me. The misleading part was that I actually sold that manuscript to Jean Feiwel over the phone back in 1985. She really dug the illustrations I’d just done on my first book — a version of Jack and the Beanstalk — and was enthusiastic to get me moving onto another project. We started talking about Jackie Grace over the phone and she indicated that I’d have the contract if I just send in a few sketches. And that’s what happened. I can assure you, James, I’ve never sold a manuscript to anyone, ever again, over the phone. Yet I keep expecting it to happen. My bad. I agree, phones aren’t what they used to be. So you’ve been at this business a long time. I published my first book in 1986. I think we are all confronted with different ideas of success, but lately I’m most proud of simply having survived. You know, just hanging around all these years through the ups and downs. It can be a tough, cold business. As I recall the line from an old PW article, “children’s publishing is a bunny eat bunny” world. But we’re still alive and kicking. Oh yes, survival is sweet. The fact is — for us to be here, doing what we started doing over thirty years ago is a victory. There have been more than a few times over the past 30 years that I wondered how in God’s name I was going to move forward — how was I going to make enough money, how was I going to stay inspired, how was I going to stay sane within the pressures of being a husband/father while working as a freelance author/illustrator (and all that that implies). So yes, to have this discussion right now — this is a good thing. Congrats to the both of us. 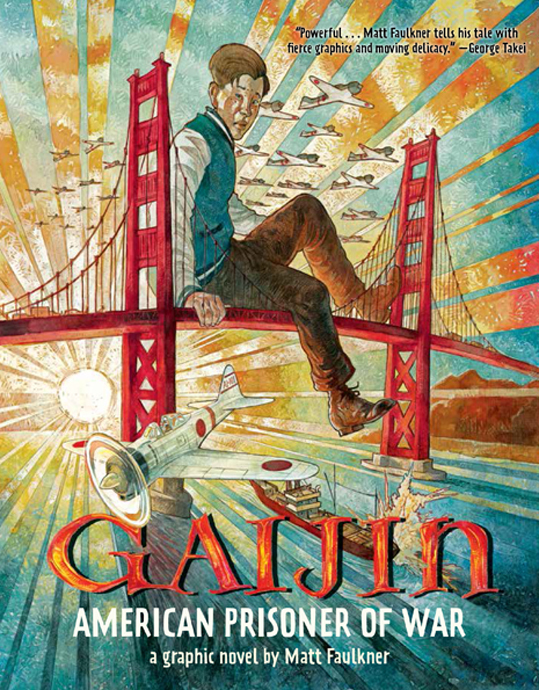 Speaking of congratulations, I’m so impressed by your graphic novel, Gaijin, which I believe is not only a terrific book, it’s an important book. Tell us about the origins of that story. I gather it has personal significance for you. Gaijin: American Prisoner of War came from an experience I had as a child and from the experiences my relatives had during WWII. During the summer after fifth grade I read a bunch of books about children who’d survived the Holocaust. It just seems that the librarian who handed me the first book kept right on handing them to me when I’d complete one. Eventually, my mom placed a piece of paper with a name and address before me — a return address from an envelope. She told me that our family had been in a concentration camp in California. 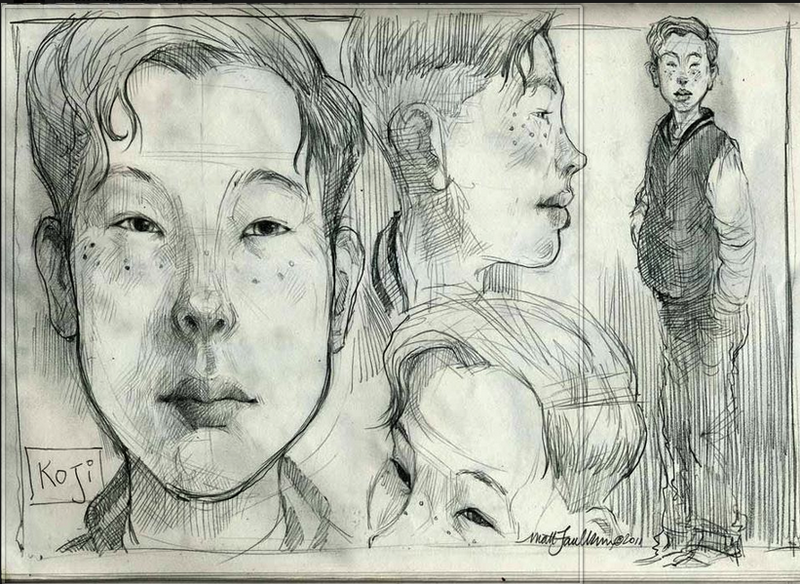 Early character study, sketch, from GAIJIN. I imagine that I was incredulous — after all, concentration camps were something horrible in Europe, not America. Not so, my mom said. She helped me to understand that my great aunt, Adeline, along with her daughter and grandchildren, had been placed in the Japanese American internment camp called Manzanar, during WWII. This was because Adeline, an Irish American, had married a gentleman of Japanese descent and hence, their children were part Japanese. At that time in America, this was enough to send a child to a prison camp in the desert. At what point did you decide that this story would be best told as a graphic novel? Fairly early in the process of developing the story I realized that the format of the graphic novel would help me best express the way I felt about the material. 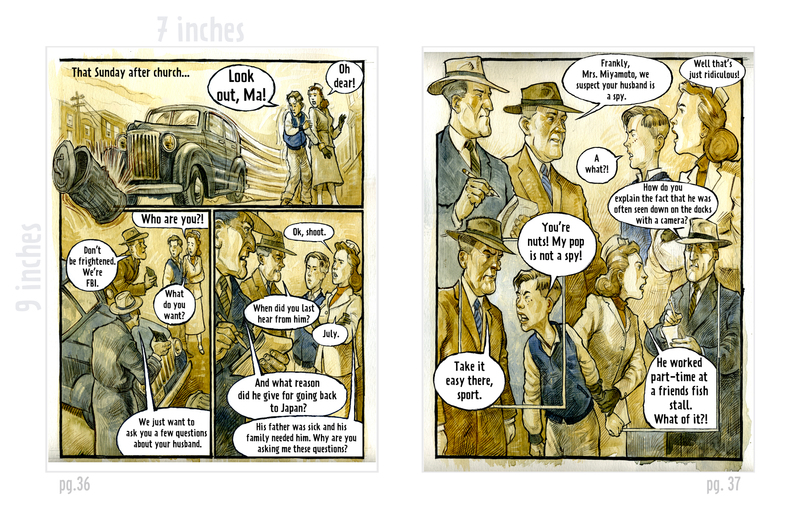 You didn’t begin your career as a graphic novelist. What attracted you to that medium? Of late, I feel more and more that this — the graphic novel — is my medium. I don’t feel that I am in any way a rigorous student of this medium. However, I know that I tell stories best in a visual format. For me, a story flows far more readily when the images and text are free to roam across the landscape of the spread, as they can in a graphic novel. It’s far more film-like. The format feels more like the experience of watching a film and to me, creating the frame work of an imagined film for my readers is what I reach for in any book, but most especially in creating a graphic novel. I can see that, and agree about the cinematic qualities. It’s interesting that you mentioned my first author/illustrated picture book, Jackie Grace, because that was seen as a bit of a risk in 1986. Why? Because it didn’t follow the traditional picture book form and was, actually, a graphic novel for 6-to-8 year olds. This was kind of a big deal back then and I recall editorial discussions which addressed this risky thing — a graphic novel picture book. It was simply not done in 1985. However, it is done now. And I’m going to do as much of it as I possibly can in my allotted time. When I look at many graphic novels, I often think, “Wow, that’s a lot of work.” Can you take us through to process of creating this book? How it began? How long it took? The idea for the Gaijin began to take a more concrete form following 9/11 when I started to hear the talk of various pundits who were advocating internment for another minority group, American Muslims. That pompous, paranoid talk got me to nail myself to my desk and begin the sketching. But it took another 9 years before Gaijin was sold to Disney/Hyperion and it wasn’t published till 2014. 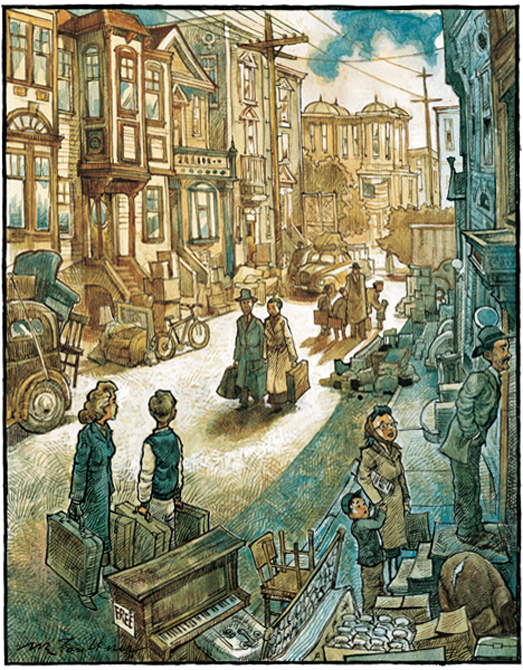 The book was created in traditional materials — graphite, water color and gouache. 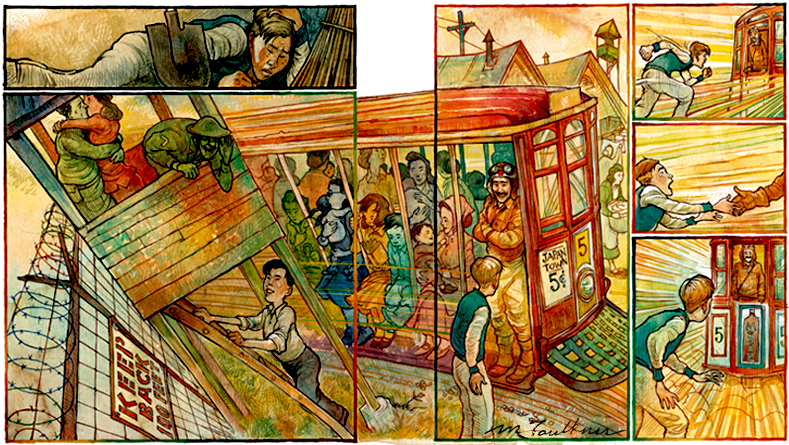 I used a brown/blue palette (reminiscent of the olive drab and khaki uniforms) for scenes set in the day time. The hero’s dream sequences were created in a hot, acidic palette. I spent a a good deal of time doing visual research — visited the sites of both the Tanforan and Manzanar internment camps etc., and created three variations of the sketch layout. 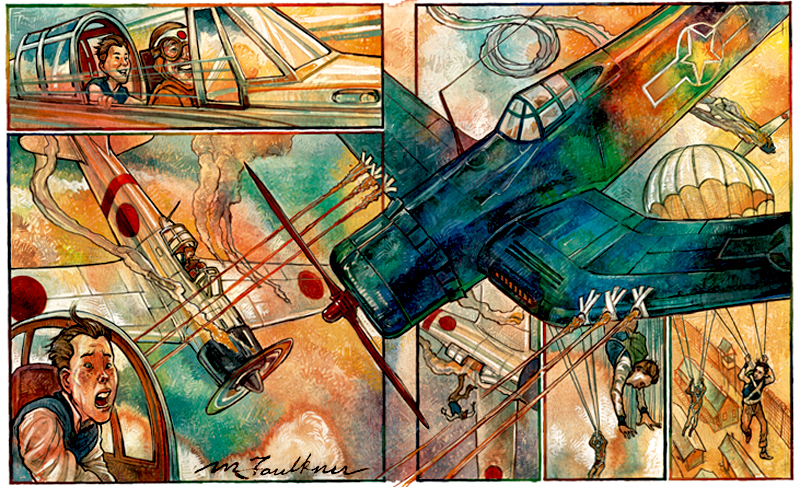 Yes, that’s right, three separate layouts for the 130-page graphic novel. A little crazy, yes, but I think this was something that had to do more with my inexperience of creating a graphic novel than anything else. Sample of an alternative sketch. 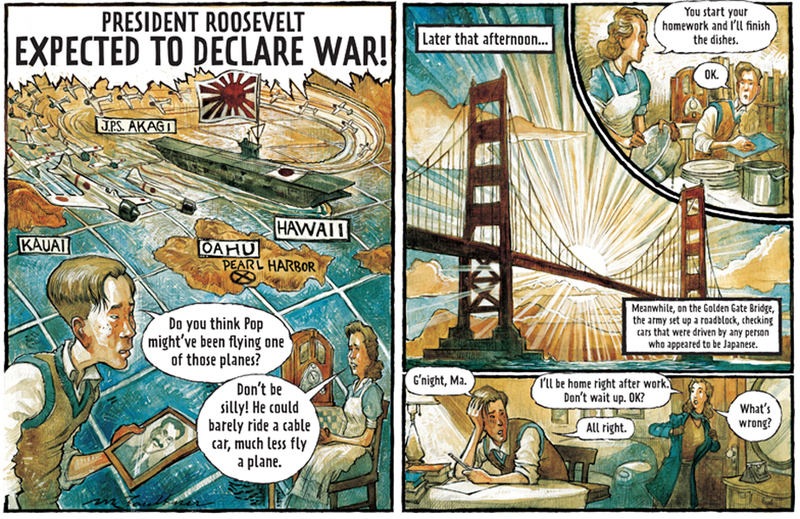 It was fascinating how you introduced the news of Pearl Harbor. Koji and his mother don’t at first realize how it will affect them personally. But the next day they begin to learn, in ways large and small, that the world has changed. From my research I learned that Pearl Harbor in 1941 simply wasn’t a place that every American was aware of the way it is today. There was so much that was left unexplained and therefore became the source of fear for both Japanese Americans and white Americans. It was important for me to express as best I could this sense of surprise, looming terror and dread. One thing that stood out for me in my research was learning that the racism as expressed by whites on the west coast toward Japanese Americans following Pearl Harbor was more than just a response to the attack. That racism was very old and very deeply rooted within California laws. There were many, many whites who were simply waiting to take advantage of the fear that the attack engendered and couldn’t wait for the removal of Japanese Americans so they could take possession of their farms, their homes and shops. From what I’ve learned, as much as it was about fear and racism, it was also greed that fueled the Japanese American internment. That’s a great point, and I think it’s something we are seeing today. The old hatreds have existed all along, waiting for the right atmosphere in order to emerge. Like Voldemort’s followers, the Death Eaters, waiting for the signal in the sky. Suddenly it’s “safe” to haul out those repressed prejudices into the light of day. But my comments aside, I think you admirably refrained from imposing any obvious editorial judgments in your book. You let the story speak for itself. Yes, I did try to refrain from inflaming what is already a hot issue. I didn’t think any editorial refinements or judgment on my part would do much to make the point any clearer. In short — we, as a nation, failed on a vast scale. We grossly mistreated over 120,000 people — half of whom were children — because of their race. It’s shocking and heartbreaking that this moment in American history –- a troubled, dark, confusing time –- is still so relevant to today’s America. What are the lessons to be learned here, in your opinion? It’s best to keep it this simple: They’re all our children. The Japanese American children which we, as a nation, imprisoned in Manzanar and over twenty-five other remote prison camps from 1942 till 1945 were all our children. Similarly, the Syrian child that drowned and whose body was photographed on that beach was our child, too. As a species, we are either going to accept and work with this reality or we’re going to continue to suffer. Thank you for those thoughts, Matt. I know I asked a lot of you today, but only because I think we need to hear your voice now more than ever. What can we look forward to from you in the future? Have you got a new book in the works? Thanks for asking. I’m currently working on illustrating a four picture book series about American ideas, ideals and people, written by Ruby Shamir and edited by Jill Santopolo at Philomel. In addition, my agent, Abi Samoun of Red Fox Literary, is currently shopping two graphic novel ideas for me right now — one is called Burrito Fever, which tells the tale of the annual march of 10,000 crazed bunnies in search the perfect burrito. The other story is about a young Japanese American who joins the army during 1944 and fights in France with the all Japanese American 442nd Combat team — the unit most decorated for it’s size in U.S. army history. Again, thanks for inviting me to talk about my work with you, James. I wish you all the best with yours. Authors and illustrators previously interviewed in my “5 Questions” series include: Hudson Talbott, Hazel Mitchell, Susan Hood, Matthew McElligott, Jessica Olien, Nancy Castaldo, Aaron Becker, Matthew Cordell, Jeff Newman, Matt Phelan, Lizzy Rockwell, Jeff Mack, London Ladd, John Coy, and Bruce Coville. To find past interviews, click on the “5 Questions” link on the right sidebar, under CATEGORIES. Or use the “Search” function. Coming soon: Elizabeth Zunon, Robin Pulver, Hannah Barnaby, and more.